Children with Down syndrome develop at a slower rate than most children without Down syndrome. They face challenges, such as being slower to learn how to talk and care for themselves. This certainly doesn’t mean these things are impossible. They just take a bit longer and some extra dedication. Here are some fun, educational activities for children with Down syndrome that will help make learning fun and a little less frustrating for little ones. Use visuals to learn sounds. Often, visual learning works best for children with Down syndrome. Sometimes, sign language can help little ones communicate and learn verbal language. You can either learn actual sign language or invent your own. For example, maybe touching the mouth represents hunger. Teaching a child with Down syndrome to take turns can amplify learning experiences. Communication relies heavily on taking turns, having a listener and a speaker, but sometimes this concept doesn’t come naturally. Demonstrating this turn taking and even verbally communicating “OK now it’s my turn” can help the learning process happen a bit faster. Use repetition to your advantage. Even though autism is usually diagnosed between the ages of 2 and 3, there are earlier signs to keep an eye out for, even in infants. If your baby rarely smiles when you approach or smiled at, that may be a sign of a developmental delay. Most babies are babbling and making repetitive sounds by the time they’re 6 months old. Between 6 months and a year, they should start responding to their name. If your child does not seem to be making these noises or responding to their name, they may and early signs of developmental delays. One of the most common signs of autism is a lack of eye contact. This sign can sometimes show in infants, but as your child grows into a toddler, if you notice a lack or avoidance of eye contact, you should look into possible autism immediately. 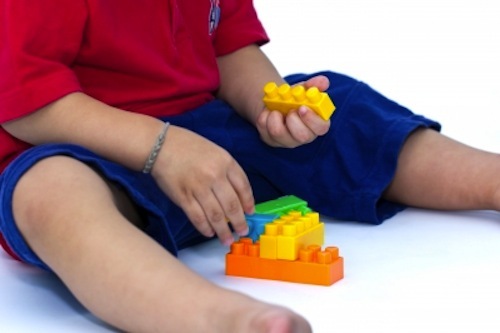 In as early as infancy, autistic children may move differently that those without autism. They may stiffen their limbs, or make repetitive motions with their hands. As they get older, these movements will often continue. Kids with autism often show abnormalities communicating early on. They may not respond appropriately in conversation with peers, struggle alone instead of asking for help or show a smaller variety of vocabulary words than their peers. -Wetherby, Amy. “Infant Toddler Checklist.” Communication and Symbolic Behavior Scales Developmental Profile. -“10 early warning signs of autism.” CBS News. -Warner, Jennifer. “Cues May Signal Autism in Toddlers.” WebMD. Here is our most recent list of preschools and child care centers who offer special needs support in the Chicago, IL area.